We all know the story of Denmark winning the European Championship from 1992, even though they didn’t even qualified at that tournament initially. But few are aware of the personal tragedy of Kim Vilfort, the Dane midfielder which scored the last goal of the 2-0 final victory over Germany. He was a key player for his country but, after the first two group matches he returned home. 0-0 with England and a 0-1 loss against Sweden, the hosts, left them very little chances to go through. So, Kim returned to Denmark, where Line, his seven old year daughter was fighting with leukemia. In the last stage. Miracles were expected, but the little girl felt sicker and sicker, so the only good news came from Malmo, were Denmark beat France 2-1 and went in the semifinals. It was the moment when Vilfort’s family, including Lime, convinced him that it was time to leave the hospital and go represent his country in the semifinals. Netherlands was expecting them and the Danes came in lead twice, but were equalized each time. Shootout was the next step and the ‘reds’ took advantage here and reached their first ever final. The fourth, and decisive kick, was netted exactly by Kim. Denmark was facing in the encounter for the European trophy, but the midfielder didn’t care too much. He returned quickly back home again to be with his little daughter which was suffering even more. This time he looked decided to not return for playing in the final, but small Line and his family made him understand that he mustn’t miss that day, which could bring glory forever for the country. He was one of the few creative and offensive players from a squad that was usually counting on defensive force. So finally, he left home. With tears in his eyes and an unimaginable pain inside his heart he fought, entered the field and in the 78th minute put the stamp on Denmark victory. At 1-0, all could still happen, but when the advance was doubled, it was certain that Germany couldn’t dream of coming from behind. 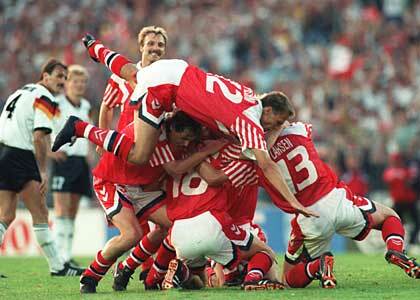 With three weeks earlier, Denmark wasn’t even on the EURO 1992 check list and now they were Europe’s champions. Unfortunately, after another three weeks the Heaven was populated by one more angel. Line passed away, with his father right on her side. The courage to send her daddy away from home when she was in such poor condition was deeply appreciated by all Kim’s 20 team mates and so they came together at the funeral. A pale consolation but surely the little angel knows that she will forever beloved. 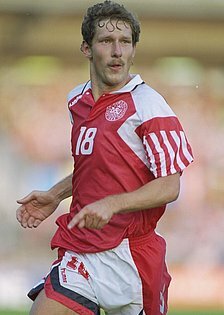 Acest articol a fost publicat în Campioni și etichetat 2-0, 2-1, 2-2, Denmark, EURO 1992, France, Germany, Kim Vilfort, Line Vilfort, Malmo, Netherlands, Sweden. Pune un semn de carte cu legătura permanentă.